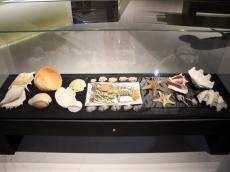 An exhibition "Rinay Museum: The pearls of the oceans" opened in Azerbaijan Carpet Museum on December 27. The museum's founder is geologist-scientist, professor Tofig Garayev. Addressing the event, chairman of the ICOM Azerbaijan National Committee, PhD in Art Studies Shirin Malikova welcomed the guests and presented a unique collection of malacology from all continents, Azertac reported. She stressed said that the collection, which is of great interest to both scientists and ordinary people, has been collected for more than 40 years and is kept in the first private museum named "Rinay" in Azerbaijan. "It is difficult to imagine that this rich collection features about 3,000 exhibits. The collection has been studied and stored by a person, who has a very broad knowledge, and loves his work ", said Malikova. She stressed that Tofig Garayev's full-fledged interests are amazing. He is a successful athlete, scientist, and collector. "Thanks to his determination, Rinay Museum is known far beyond our borders. The exhibitions are held in different countries around the world," she added. Deputy Culture and Tourism Minister Sevda Mammadaliyeva said that the museum created by Tofig Karayev is the only museum in this country and has been selected by its originality. Tofig Garayev spoke about museum's activity. He thanked the Ministry of Culture and Tourism and the Azerbaijan Carpet Museum for organizing the exhibition. Then the guests got acquainted with the exhibits. Notably, the exhibition will last until January 4. Rinay is a malacological museum of natural history in Baku. It is also the first private museum in the country. The museum's collection includes approximately 5,000 clam shells (the shells of bivalve molluscs) from 86 genera worldwide. The museum also displays hundreds of fossil clam shells. Some of these were obtained by exchange from the Austrian, Canadian, Argentine, Spanish, German, Ukrainian, Russian, Turkish and Indonesian paleontological university museums. The basis for the museum collection was laid down in the early 1930s by Sadykh Garayev, an Honored Engineer and Honored Inventor of the USSR. Garayev's clam shell collection was preserved by his wife Prof. Jeyran Ibadova, and was transferred from Rinay to the History Museum of Azerbaijan in June 2007. Sadykh Garayev's son Tofig Garayev continued the effort to improve his father's collection. He previously worked at the Geological Institute of the Academy of Sciences of Azerbaijan SSR. He systematized the collection, and conducted a taxonomic revision of modern molluscs. In 1989 the museum received official status.